Sesame Oil is extracted from sesame seeds and has a light or dark brown color. The oil has a nutty flavor and is edible. While using it in your meals is a matter of acquired taste, there is nothing stopping you from reaping the benefits of the oil for skin and hair care. Sesame oil is rich in the good kind of fatty acids which act as emollients and can give you super awesome skin. Do you want to know how to use sesame oil for glowing skin? Read on to find out more. 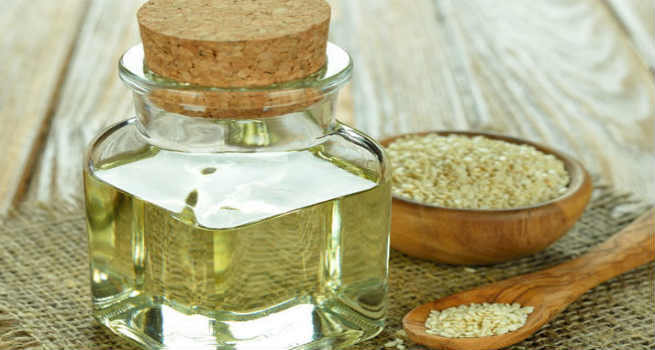 Why is sesame oil so effective? Sesame oil is rich in natural fatty acids like linoleic, oleic and palmitic acids and in Vitamin E. The oil is rich in antioxidants. It gets absorbed quickly into the skin, nourishes it from deep within and helps rejuvenate your skin rapidly. There are many ways in which you can use sesame oil for glowing skin. The oil is suitable for all skin types. Since it is anti-inflammatory and anti-bacterial, you can also apply it on acne prone skin. However, if you have very oily skin, use it with caution after a patch test, since one cannot be too sure of how the skin reacts to oil. Whether you use it for cleansing the skin or for massaging, the oil is extremely nourishing and will leave your skin silky smooth. Here is how you can use it. Sesame oil has the ability to draw out toxins from the skin and also to clear your pores. The oil works best when it is warm. Before your bath, apply warm sesame oil all over your face and neck in circular motions and rub well. Leave it for 5 minutes and wipe off with a cotton ball or a wash cloth. Wash your face with your face wash. Doing this everyday before your bath will leave your pores squeaky clean and also give your skin a glow. Applying the oil before washing your face will ensure that your skin does not become overtly dry and remains supple. Since sesame oil is rich in fatty acids and vitamin E, it acts as a great all natural alternative to your moisturizer. However, since it has a strong smell that you might not favor over your sweet smelling moisturizer, we suggest that you add a couple of drops of your favorite essential oil to equal parts of sesame and almond oil. Once you have this mixture ready, smooth it on the skin after your bath every day and see your skin respond to it like a dream! Sesame oil has the incredible ability of forming a protective film over the skin to prevent it from damage done by free radicals. If you think that you do not want to use sunscreens laden with chemicals, then applying a thin film of sesame oil on the skin is a great alternative. To use it, mix sesame oil with a few drops of carrot seed essential oil ( it has the highest SPF). Apply it on the skin after cleansing it for sun protection that is effective and natural. Sesame oil prevents the skin cells from oxidation and also helps in skin rejuvenation. The antioxidant sesamol in the oil prevents appearance of wrinkles and fine lines in the skin. You can replace your night cream with a few drops of sesame oil mixed with a drop of lavender essential oil. Massage this thoroughly on the skin in circulatory motion to improve blood circulation. It also helps fight any skin infections as you enjoy your sleep. You will wake up with renewed skin next morning.